Cabo de Hornos (Cape Horn) is the World's southernmost National Park, located at the southern tip of South America, with an area of 631 km2, including the group of Wollaston and Hermite Islands. Created in 1945, administratively belongs to the Antarctic Province, Region of Magallanes, Chile. The relief presents modests elevations, the highest peak being Monte Hyde at Wollaston Island, with 670 mts. above sea level. Summer temperatures rarely exceed 12 ° - 13 ° C, while in Winter these are common below 0°C. Tours can reach this distant park either by air or sea from Puerto Williams which is the nearest city, approximately 12 hours navigation away, Ushuaia in Argentina or from Punta Arenas, the regional capital. Touristically, its greatest attraction lies in its remote location within the Globe, highlighting the world famous Cape Horn, challenged every year by dozens of navigators from around the World. 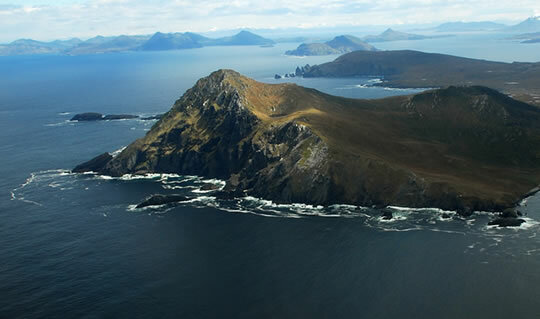 Cape Horn is the most southerly of the great capes of the southern hemisphere and traditionally it has been considered the southernmost point of the Americas, although in reality this corresponds to Águila Islet, at Archipelago Diego Ramirez. Cape Horn is probably the most dangerous place on Earth to sail a ship, over the centuries, hundreds of vessels have sunk in its waters. In recent years, the tourist ships visiting the area have increased considerably. Depending on the weather conditions, passengers are allowed to get down to the Horn Island to make a visit to the "Cape Horn- Albatross Monument", the Monumental Lighthouse, the Monument to the Unknown Sailor and to the small Chapel. The Albatros- Cape Horn Monument, inaugurated on 5 December 1992, highlights the figure of the Albatross, characteristic bird of this part of the World, steel plates silhouette by the sculptor José Balcells which honours all sailors who have died trying to cross the dreaded Cape. South of this National Park and islands lies the stormy Drake Passage, anteroom to the Antarctic Continent. The Chilean companies Lakutaia and Cruceros Australis offer safe tours to this remote part of Chile and the World. Fauna: Leopard Seals, Peale's Dolphins, Toninas (Chilean or Black Dolphin), Humpback Whales, Sea Lions, Chungungos (Marine Otters). Among the Birds are the Kelp or Dominican Gulls, Southern or Antarctic Giant Petrels, Southern Royal Albatross, Antarctic and Magellanic Penguins. Flora: Very few forested areas with Lenga Beech (Nothofagus Pumilio), Coigue de Magallanes (Magellanic Coigue), Canelo (Winter's Bark), Ñire (Antarctic Beech). Abundance of lichens and mosses due to harsh weather and high humidity conditions.